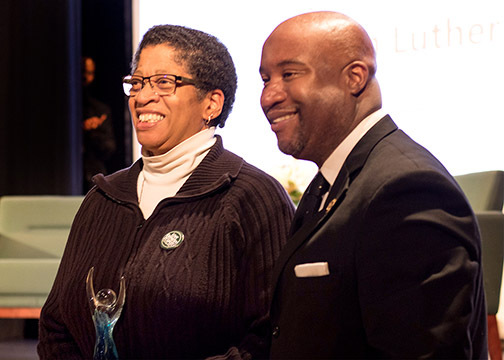 SAN LUIS OBISPO —An associate dean in Cal Poly’s College of Science and Mathematics, recognized as a strong advocate of inclusion and equity efforts for underrepresented students, is the inaugural recipient of the campus MLK Legacy Award. Camille O’Bryant, who is also a kinesiology professor, received the honor Jan. 16. The award salutes a campus community member who upholds the legacy of the Rev. Martin Luther King Jr. by leading with love and hope to create a legacy of diversity, equity and inclusion. O’Bryant joined the faculty at Cal Poly in 1999, and her efforts to promote diversity and inclusion on campus have been a focus of her teaching, scholarship and service to the campus and local community. She serves as chair of the college’s Inclusion and Equity Committee, a group of faculty and staff who focus on addressing policies and practices that are barriers to student success. She is also the co-founder and a moving force behind the university’s Love, Empathy, Respect campaign, a grassroots initiative designed to reinforce to students that the university remains an inclusive community. The Atascadero resident is one of the first BEACoN Mentors on campus, a group that advocates for students from underrepresented backgrounds, giving them the knowledge and tools to succeed at Cal Poly. Advocacy continues to be a priority for O’Bryant. The steady stream of students filling her office, many of them on academic probation or struggling in other ways, receive academic and administrative expertise as well as emotional support and encouragement. In her two decades at Cal Poly, O’Bryant has served as chair of the Kinesiology Department and vice chair of the Academic Senate, among other positions. Her commitment to service and leadership extends beyond the university. She is the alumnae trustee at Massachusetts’ Smith College, one of the largest private women’s colleges in the nation and her undergraduate alma mater. She has served as president of the National Association for Kinesiology in Higher Education (NAKHE) and the Western Society for Physical Education of College Women. In 2016, she was named a NAKHE Fellow for being an acknowledged leader in the field of kinesiology and providing outstanding service to the professional organization. Her many additional honors include the Cal Poly Distinguished Teaching Award in 2014 and the 2015 E.B. Henderson Award from the Society of Health and Physical Educators America, which recognizes those who have increased the involvement of ethnic minorities and/or underserved populations in health and physical education. Photo information: Camille O’Bryant, an associate dean in Cal Poly’s College of Science and Mathematics and a strong advocate of inclusion and equity efforts for underrepresented students, receives the first campus MLK Legacy Award from Jamie Patton, the university’s new assistant vice president for Student Affairs — Diversity and Inclusion. The inaugural award was presented Jan. 16 in Chumash Auditorium.